Uncle Lightfoot - Awarded the ABCT Self-Help Book Seal of Merit Is your child afraid at nighttime? Is your child afraid to sleep alone in the dark or to go into darkened bedrooms? Is your child afraid of noises, monsters, and nightmares? Do fears and tears turn your child’s bedtime into a battleground? Help your child learn to feel more comfortable at night so both of you can get a good night’s sleep. Discover how to help your child through a story woven around fun games and a series of farm adventures. Is your child afraid at nighttime? Is your child afraid to sleep alone in the dark or to go into darkened bedrooms? Is your child afraid of noises, monsters, and nightmares? Do fears and tears turn your child’s bedtime into a battleground? Help your child learn to feel more comfortable at night so both of you can get a good night’s sleep. Discover how to help your child through a story woven around fun games and a series of farm adventures. 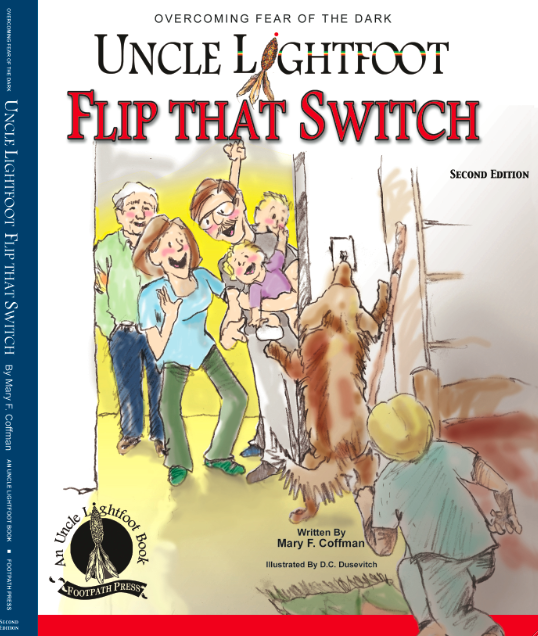 Uncle Lightfoot, Flip That Switch is designed to help children, ages 5 to 10, overcome fear of the dark and other nighttime fears. 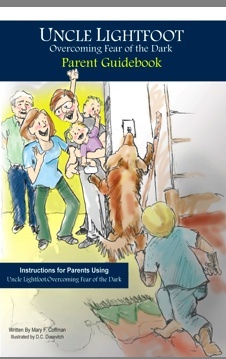 The book uses cognitive-behavioral techniques in a lively, humorous way. The 17 games in Uncle Lightfoot are designed to help teach skills related to going into dark rooms, noises, nightmares, and sleeping alone in the dark. The many delightful illustrations provided by D.C. Dusevitch, an award-winning artist, focus the child’s attention and add to the fun.﻿﻿﻿﻿ A Parent Guidebook is included in the back of the book. Uncle Lightfoot, Flip That Switch is listed as a Seal of Merit self-help book by the Association of Behavioral and Cognitive Therapies. After a research study was conducted on the academic version at Virginia Tech under the supervision of Dr. Thomas Ollendick, the Second Edition was released. The Second Edition contains further refinements of the earlier editions. ﻿The chapters are very short! Copyright 2019 Footpath Press LLC. All rights reserved.